Replay A/V records from thousands of TV and Radio stations, capture Podcasts, save XM and Sirius, download streaming video clips, make copies of audio archives, or even record from a radio attached to your PC. 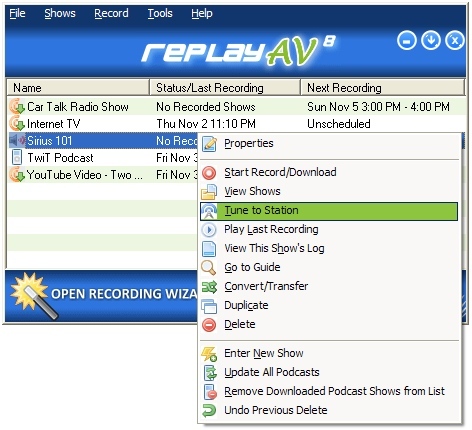 Replay AV is a great way to Record Internet Radio, Online TV & More. Replay AV is the only software that combines Stream Capture, Audio Recording and an Enhanced Podcast Client in one easy-to-use interface. Replay AV is the only software that combines Stream Capture, Audio Recording and an Enhanced Podcast Client in one easy-to-use interface. This means that you'll get the best recording quality and the ability to record multiple shows simultaneously. It's easy to capture video clips or audio archives. Just choose Record, Stream Capture from the menu, play your clip, and record it now or later. Record web surfing and replay it easily and test web sites automatically! Qweas is providing links to Replay A/V 8.53 as a courtesy, and makes no representations regarding Replay A/V or any other applications or any information related thereto. Any questions, complaints or claims regarding this application Replay A/V 8.53 must be directed to the appropriate software vendor. You may click the publisher link of Replay A/V on the top of this page to get more details about the vendor.